Between the 20-24 of December 2017, Qatari Emir Sheikh Tamim bin Hamad Al-Thani travelled to Senegal, Mali, Guinea, Burkina Faso, Côte d’Ivoire and Ghana. Since Sheikh Al-Thani became Emir in 2013, Qatar’s African policy has been primarily focused on East Africa, where the emirate has established significant diplomatic relations with countries such as Eritrea, Somalia, Sudan and Kenya. However, the Saudi and United Arab Emirates-led diplomatic and economic embargo of Qatar could force the Emirate to rethink its policy toward the continent. The Emir’s visit underlines the strategic importance of Africa in the ongoing Gulf crisis. The shadow of the ongoing blockade of Qatar was ever-present in the lead up to this six-nation tour. Although subjected to intense pressure from Saudi Arabia and the United Arab Emirates (UAE), the only country that the Emir visited on this to have taken a position on the blockade was Senegal, which recalled its ambassador to Doha this past June. In contrast, President Alpha Condé of Guinea – who also serves as Head of the African Union – called for dialogue and the pursuit of the Kuwaiti mediation, while Ghana surprised many observers by announcing that the country would open an embassy in Doha, even as the crisis was in full swing in November. That said, it is still too early to point to a clear Qatari strategy in sub-Saharan West Africa, a region which lacks a dedicated department at the emirate’s Ministry of Foreign Affairs. Historically, Doha has shown little interest for the western part of the continent. While Qatar does have investments in sub-Saharan Africa, these were primarily made through partners already active in the emirate (such as Qatar’s partnership with French oil company Total in the Congo), or targeted banking institutions, such as Qatar National Bank’s acquisition of a 12.5 percent stake in Ecobank, a regional commercial bank operating in many African countries. Impact of the Saudi embargo of Qatar – Qatar is shown in green, countries or territories that have cut ties with Qatar in red, and countries or territories that have downgraded ties in pink. Notably, there was no announcement during the tour that Doha would significantly invest in the region. Although a series of commercial contracts was signed (especially in the aviation, infrastructure development, education and health sectors), for the time being cooperation has been confined to provision of grants, financial assistance or concessional loans. As for a potential security partnership, it is most likely that Qatar will be lagging even further behind, given the controversy that resulted from its decision to send hundreds of troops to support the Libyan rebels who overthrew Muammar Gaddafi’s regime. Nevertheless, the absence of spectacular announcements or major trade deals should not overshadow the symbolic force of the Emir’s trip, especially within the broader context of the Gulf crisis. 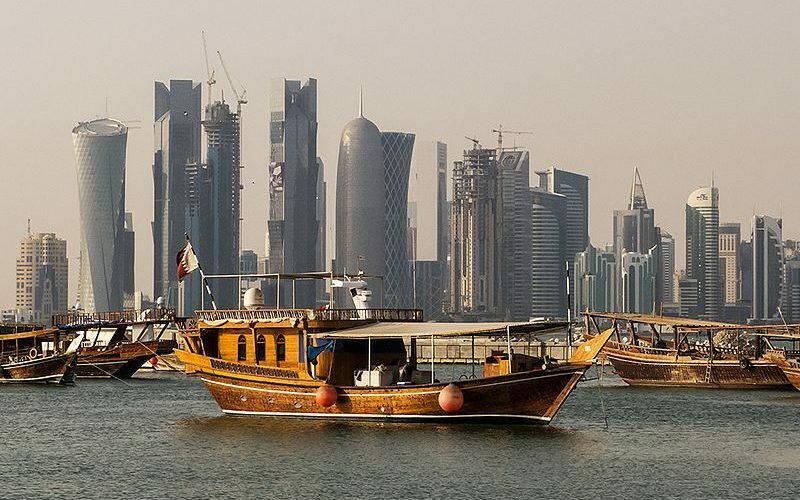 The embargo has not hurt Qatar’s oil and gas industry – the emirate’s main source of funding for diversification projects – and the Qatar Investment Authority sufficent reserves to allow Doha to face the embargo for many years. However, the blockade has undoubtedly diminished Qatar’s regional influence and soft power. This creates a de facto threat to the monarchy’s internal stability, as it views its foreign policyas a means of survival in a region riven by rivalries. This threat is exacerbated by the fact that Doha’s Emir-centric remains excessively personalized and is not solidly anchored in institutions. In this context, Sheikh Tamim bin Hamad Al-Thani’s tour is part of a drive to shore up support for his country across West Africa, a region that Saudi Arabia and the UAE are also courting. In mid-December, Riyadh and Abu Dhabi announced that they were respectively releasing $100 million and $30 million in support of the G5 Sahel Joint Force, clearly indicating their willingness to be more involved in the implementation of the peacekeeping operations in the Sahelian strip. Since the outbreak of the Gulf crisis, the lobbying dynamics at work toward the G5 Sahel Member States show the strategic importance of West Africa for the involved parties. The security alliance includes Mali, Burkina Faso, Niger, Chad, Mauritania. Although the last three have sided with the Saudi-Emirati coalition, Mali and Burkina Faso have not bowed to pressure from Riyadh and Abu Dhabi. Saudi Arabia has repeatedly called on the countries in the Sahel zone to make their position clear, but it is very unlikely that Bamako and Ouagadougou will turn their back on Qatar, as these two states have just established diplomatic relations with Doha and have an eye on the emirate’s capital flows. In August 2015, state-run company Qatar Mining obtained its first African permits in Mali, and is now operating on four sites across the country. Even as it increases tensions in the Sahel, the Gulf crisis also raises serious concerns for the stability of the Horn of Africa due to a long-standing border conflict between Eritrea and Djibouti. Territorial tensions between the two countries arose in 1996 and 1999, but the current crisis dates back to 2008, when Eritrea sent its troops to the disputed zones, which include the Gabla hill (or Ras Doumeira) and a small island called Doumeira. Qatar successfully mediated between the two countries and prevented any further military confrontation. Eritrean troops left and 400 Qatari military observers were deployed in the area until a peaceful settlement to the conflict could be found. However, when the Gulf crisis began, Qatar withdrew its peacekeeping contingent due to Eritrea and Djibouti’s decision to downgrade relations with the emirate. Eritrea jumped on the occasion and seized the disputed island, a move that has revived territorial tensions in the region. Disputed territory between Eritrea and Djibouti. Two other countries have also been impacted by the Gulf crisis. The first is Qatar’s longtime ally Sudan, which recently signed a deal with Turkey to increase trade ties and establish a strategic cooperation agreement. As Turkey provided aid to Qatar at the onset of the crisis, the Sudanese-Turkish agreement likely raised anxiety in Riyadh and Abu Dhabi. Turkey has a military base in Qatar and said it would increase its presence to 3,000 troops in the coming months, fueling the fear of a Turkish military expansion in the Gulf region. Finally, Somalia’s refusal to break diplomatic relations with Qatar is particularly important. The internationally-recognized government in Mogadishu has long enjoyed positive relations with Saudi Arabia, its biggest trade partner in the Gulf region. Somalia has even provided tactical support to Saudi Crown Prince Mohammed bin Salman’s war in Yemen. Nonetheless, Somalia’s president, Mohamed Abdullahi Mohamed, has sided with Qatar and called for dialogue between all parties. According to rumors, Mohamed’s support for Qatar is a return of favor for Doha’s financial support during the 2017 Somali presidential election. Whether or not this is true, Somalia’s desire to stay neutral will likely be tested, as it recently received $50 million in new aid from Saudi Arabia in a clear attempt to test Somalia’s neutrality. Among the numerous risks and uncertainties concerning the outcome of the Gulf crisis, one thing is certain: it will continue to have an impact and spread across Africa, in both eastern and western parts of the continent. Previous articleWhat Prompted North Korea to Start Talking? Next articleWill Thailand’s New ‘Smart Visa’ Be A Game Changer For Local Tech Start Ups?